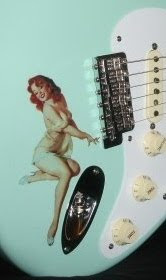 Rockabilly, Surf and Swing Are Hot!! 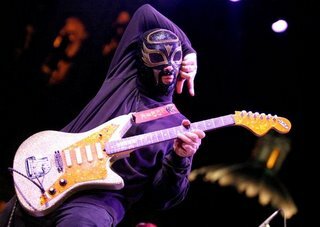 You're looking at Eddie Angel, guitarist for Los Straitjackets. Even though Eddie's wearing the mask, I'm really more interested in that mondo bitchin' guitar. It's a DiPinto Galaxie 4! Don't forget it either! This week I've been checking out bands and musicians who play music that many would consider "nostalgic", "retro", "novelty" or even "gimmicky". Funny how people don't equate a cheeseburger, fries and a milkshake with those words. These remain everyday things that are everywhere; "contemporary", right? We all know that mainstream trends, styles and fashions cycle and change, but many artists go on creating what they like to create. Some people like cars with fins, not because they're "old", just because they like the look. I've had a ball this week checking out and listening to the music of artists who are doing what they do for "right now". Most weren't even born when the styles they represent were "mainstream", yet their genuine affinity for these forms is a glue that maintains our music culture, and their enthusiasm makes what they create, far from obsolete. Eddie Angel, Danny B. Harvey, Smitty Factor, Devil Doll and Danny Dean and the Home Wreckers. These artists, and many more, represent the original Rock-n-Roll spirit. It's important to differentiate though, that these musicians are not "nostalgia tribute acts". They are creating right now. Thanks to the internet and other media branch-out, artists have more outlets for being themselves, and the people are able to recover what has been obscured by mass corporate media. Art and culture isn't as linear as the media tries to present it. If Alan Freed were here today, he'd be an internet guy driving a new Lexus, WITH FINS! Dip your french fries in that! Guitar music of all genres!